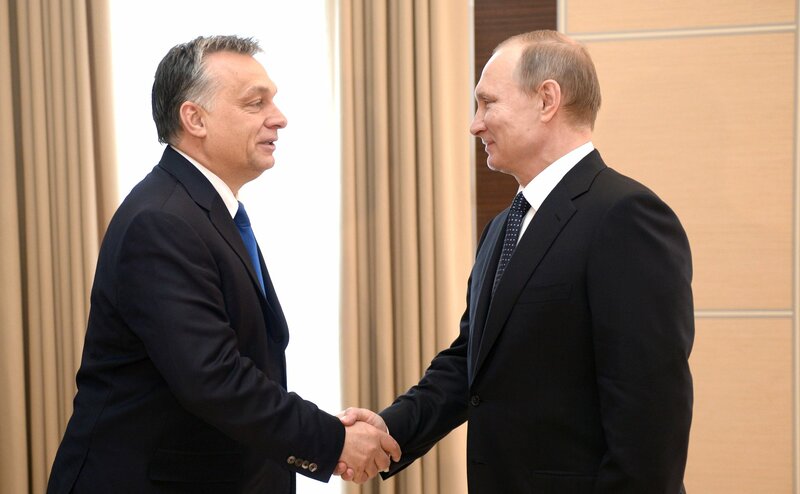 Russian President Vladimir Putin with Hungarian Prime Minister Viktor Orban. Russian-Hungarian trade relations are "mutually advantageous"
Russian President Vladimir Putin has no doubt that trade between Russia and Hungary will return to previous levels. "I am certain that over time we will be able to put our bilateral trade back into the steady growth trajectory, as is consistent with our shared interests," Putin told a press conference after talks with Hungarian Prime Minister Viktor Orban on Feb. 17. Russian-Hungarian trade relations are "traditionally close and mutually advantageous," he said. "Russia is among Hungary's three main export markets outside the European Union," the president said. In 2015, trade between the two countries dropped by 40 percent, he said. "This drop was due primarily to conjunctural factors: the instability of foreign exchange rates and, above all, energy prices and - as should also be noted here - the anti-Russian sanctions introduced by the EU," Putin said. Moscow "highly appreciates the Hungarian government's sincere intention to gradually develop friendly and broad bilateral relations," the president said.